Are You Ready To REELOUT? Frequently Asked Questions! 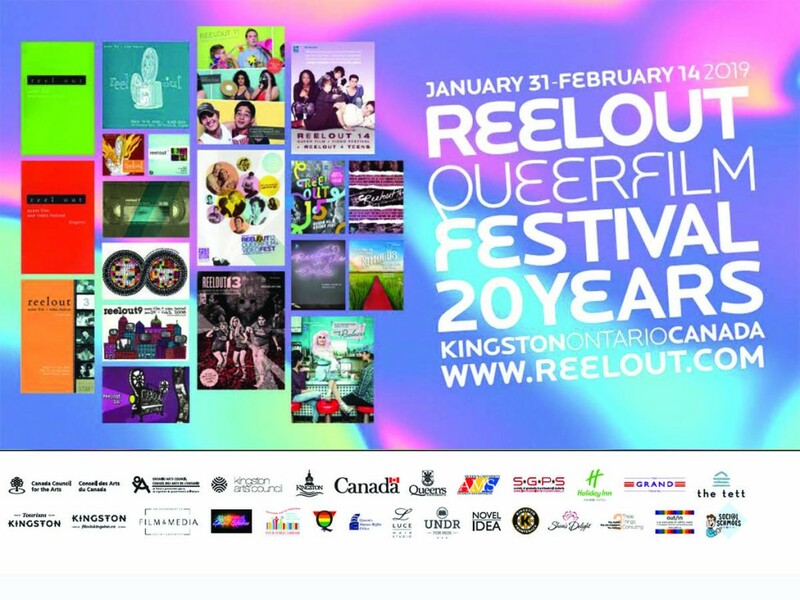 The 20th annual Reelout Queer Film Festival starts Thursday, January 31st and runs for 15 days with our Closing Gala on Thursday, February 14th with 39 different events including 116 films from 14 different countries, one circus performance, two musical performances, one animation workshop, dozens of visiting filmmakers and one outrageous male burlesque show. Every screening is a party! Where are the movies screened? Primarily all film programs are at Kingston’s downtown, independent arthouse cinema, The Screening Room at 120 Princess Street. However this year we do have a couple of screenings at the Isabel Bader Centre for the Performing Arts (390 King St West) and the adjacent Tett Centre for Creativity and Learning (370 King St West). The Boylesque TO show A Briefs History of Time is at The Mansion (506 Princess St) and the Closing Gala PARTY Karaoke For Your Life Drag Queen Karaoke is in Monte’s Lounge which is part of the Tir Nan Og Irish pub in the Prince George Hotel next to Kingston City Hall at 200 Ontario St. Please note that The Mansion is not wheelchair accessible. All other venues are accessible . More info on venues here. I’m straight/cis gender but I’d love to come see some queer films but I don’t want to take a seat from someone in the community. Should I stay home? NOOOOOOOOO. Let’s face it, a queer film festival didn’t sustain itself for 20 years from just the support of the LGBTQ+ communities. We want EVERYONE to feel welcomed at our festival but just tuck it in the back of your brains that this is a very special event for the LGBTQ+ communities first and foremost so be a good ally and be respectful. I’m writing a paper about Reelout for my class. Can I bring my laptop or other illuminated device to write notes? It’s a movie theatre. No. See answer above about respect. I bought my ticket online do I have to print off the receipt? No but have it ready on your phone and show it to the Reelout Box Office so we can give you an ACTUAL ticket. Do not wait to show your phone to the ushers at the theatre door, they need a tangible ticket to rip. Are there films for children/youth? There are very obvious programs designated for children and teens (Family Fun For Everyone and Reelout for Teens). This festival is geared to adults so we ask that parents/guardians research the films before attempting to bring their children. Programs with explicit content will be restricted to 18 years and over. I would love to come but I don’t have money for a ticket, are there subsidies available? Reelout means it when we say EVERYONE is welcome and that includes people who have financial barriers. Please visit the STAFF page and email Matt Salton, Executive Director and let him know which film programs you would like to attend and your name. You will receive a confirmation email letting you know when to pick up your tickets at the Reelout box office. If there is a filmmaker in attendance at my screening and I’m too shy to ask them questions can I approach them after? Chances are, our visiting artists don’t bite hard and actually love engaging with our audiences. We always have Q&A opportunities right in the theatre but please feel free to approach our guests in the lobby with your questions! Public Transit?! Screw that! Me and My Car, where do we go? There is actually a city parking garage attached to The Screening Room on Brock Street between Wellington and Bagot Streets with an entrance right into the theatre itself. Parking for both The Isabel Bader and Tett Centres is limited and located on the southwest side of the Isabel Centre. « Calling All Memories! » The 2019 Reelout Kim Renders Outstanding Performance Nominees are In!